Comments Off on New Interactive Online Marketing Website Launched! 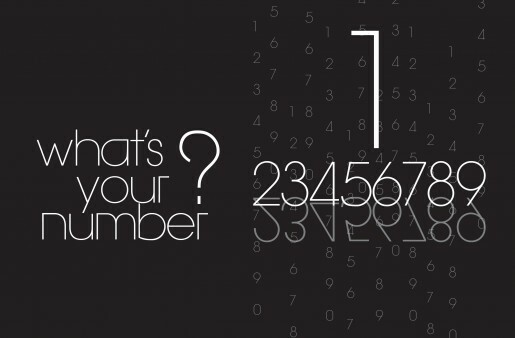 It’s a numbers game these days. Let us help you get your numbers up with fresh, new and exciting marketing tools to help your school get noticed! See our newsletter for schools. Comments Off on Your Project? Gift Cards a Win for Non-Profits! Comments Off on Gift Cards a Win for Non-Profits! It’s funny how one idea leads into another. Being in the creative field, that’s often how it works. We brainstorm, research and throw ideas around all the time. Sometimes we begin leaning towards one direction, but then, more ideas come to mind that lead is into another. The end result is a culmination of all of our wacky, and at times, pretty clever thoughts and ideas. That’s how we ended up with the idea of helping local community agencies. While creating business Christmas gift certificates for our marketing services, we were going through the details on what could be done and how it should be redeemed, and all of a sudden, we realized that non-profits could use some help too. And so, the birth of the gift card for non-profits came to fruition. While this is late in the season, we decided to go ahead anyway, with the aim of expanding the concept further in the future. Then we thought, ‘Hey we would like to help too!’ Why not create a contest for the agency that receives the most donations in gift cards? We looked in our pocketbook and our production schedule and decided that we could donate $5000 worth of free services to the winner. 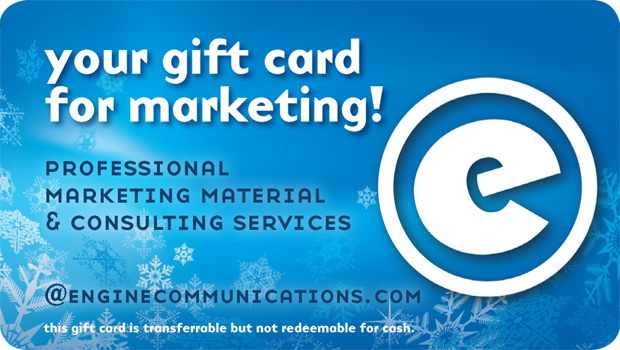 So, if you’re looking for a new idea for giving this Christmas, something that counts to make a difference in your community, you can now give the gift of professional marketing, consulting and creative campaigns to your favourite local charity or not-for-profit organization! Contest closes January 31st, 2012. We hope you can participate, spread the word and we certainly also hope you like the idea. Wonder what we’ll think of next! Comments Off on April showers bring PR Disasters? Comments Off on Brand that Facebook Page! 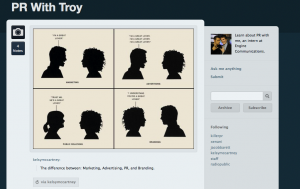 Recently I read an article from Techipedia about “Building the Perfect Facebook Page for 2011.” This article breaks down and simplifies the page layout. It is a great resource for companies, small businesses and not-for-profits. Normally, the a page looks like an extension of Facebook with your logo on it; however, customizing your page will easily create brand awareness and continuity. Many people realize the importance of a great looking website, but underestimate the importance of a great looking fan page. Having an underwhelming fan page will get you an underwhelming response. 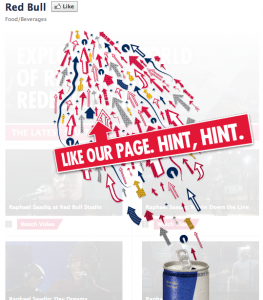 Companies such as Pepsi, Red Bull, and McDonald’s realize the potential opportunity and have created a page that is consistent with their image and looks fantastic. Creating a branded, stylistic Facebook page will entice customers to check out your company. You will get your message out, not Facebook’s. Talk with us today and we can help your brand successfully use Facebook Pages. Comments Off on Tumblr: The next Star? Recently I have begun to experiment with a new (2008+) and growing media tool: Tumblr. The tool combines Twitter and Blogging to create a “micro-blog.” Instead of short posts on your WordPress or Blogger account, you post small updates on your Tumblr page. These updates can be larger than Twitter’s 140 character limit, but users are encouraged to keep updates small. Multimedia can be uploaded to a page directly, much like a blog or a Twitter pic link. Tumblr wants you to Save Twitter for short links and updates, blogs for longer discussions and Tumblr for longer than Twitter updates but not long enough to merit a new blog post. On one extreme there are blogs (long, in-depth) and the other extreme is Twitter (short and shallow). Tumblr strives to hit the golden mean and let users post medium posts, enhanced with embedded multimedia. My favourite feature is the news feed, which standard blogs do not have and acts just like the Twitter feed. Users can “reblog” their favourite posts directly from the news feed. Does it work? From what I have seen so far, Tumblr is easy to use and is quite unique. If it was not for their technical instability I think Tumblr would be the next big social media platform. The instability means that users can never know whether their posts will be posted or lost. They won’t know if people will even be able to access their page when Tumblr servers go down. Tumblr will not continue to grow if users become frustrated with technical glitches. Tumblr is a neat tool and has a vibrant community if they can fix their issues I can see it becoming quite popular. I definitely recommend checking it out and see if it is useful for you and your organization. As we say on our website “a brand is a powerful collection of perceptions in the mind of a consumer.” Although your brand image depends on what your consumer thinks, you can do many things to help foster a positive brand image. A relatively easy way is to start from where you do business. Whether you are a manufacturer, small business, multinational or creative business, your location can make a lasting impression. A great location will convince people of your mission and your passion. A great example is the BMW headquarters (seen in the YouTube video). The tower was designed in the shape of four-cylinders, which alludes to a four-cylinder car engine. Also, as I begin interning here at Engine, the first thing I noticed is that they take their mission to heart. Positioned at a railway station, the constant rumbling, horn-blasting and bell-ringing remind me that we are here to drive businesses toward success. It really makes a lasting and great first impression on both consumers and employees. Take a look at your business, or your place of employment. Does the location reflect your mission? The web is an ever-changing symphony of technologies and trends, that when blended together in harmony, produce great experiences in the form of those websites that populate our bookmarks list and the links we share with our friends. This past year (2010) brought us the promise of a paradigm shift and laid the foundation for some major changes to the way we think about web design. For the first time in the history of the web, we have to assume that any content must be accessible from devices other than computers and intentionally plan for mobile devices. Shifting our thought from designing a separate website for mobile devices to designing mobile devices for the web, has allowed us to create new technologies like geolocation to tailor web content to your geographic location automatically (Foursquare and Facebook Places use this). There has also been a sharp decline in the use of Adobe’s proprietary Flash plugin to display essential content or navigation because it has been handicapped by a severe lack of support in the mobile marketplace. So what lies ahead on this continuing evolution of web design, and how can we plan to design our sites with 2011 (and 2015) in mind? Here are a few trends I see in the near future that are mostly simple design choices within the reach of any new website, that will make your site a trendsetter. We’ve experienced an almost unbelievable explosion in the use of mobile devices for browsing the web with smartphones, but with the introduction of tablet computing into the mainstream last year with the iPad and many competitors soon to be on the market. We know this is only the tip of the iceberg, so how can we design with mobile touchscreen devices in mind? Touchscreen devices have two states: touching, or not touching. There’s no ‘hovering’ with a touchscreen, so interactive elements that rely on a mouse hovering over a link (a rollover) simply won’t work on a touchscreen. The good news is that almost any rollover can be converted to a click toggle instead just by making a few minor alterations to code. You should steer away from relying on rollovers for navigation or displaying your information, but having rollovers for animations or effects is still okay as long as you assume no touchscreen users will be able to see these effects and they don’t alter their ability to navigate the site. Many sites suffer from being too wide to be comfortably readable. The line-length of text that works best for legibility is somewhere between thirty-five and one hundred letters long. Anything longer is simply a chore to read, and anything under thirty-five letters wide causes eye strain. Try building your site to fit within 960 pixels wide, think of the width of a sheet of Letter-sized paper. Remember you can scroll up and down a website all you want, but the wider the design is the hard it will become to navigate. Both mobile and desktop users can also see a narrow website equally well. Flash is a proprietary plugin made by Adobe, and because of this there is support only on the operating systems which Adobe chooses to plugins for, and with varying levels of support at that. There is no Flash plugin for most mobile platforms and even when Adobe has created a plugin, there have been many issues with running Flash on mobile touchscreen devices because most Flash designs cannot capture the multiple pointers simultaneously which breaks the multitouch gestures used on touchscreen devices. A coming trend for web design is featuring bold photography, even as large as a site background. If a picture is worth a thousand words then why not make those pictures speak the best of you and your brand? A poor photo takes the same amount of resources to view on your site as a great photo, but a poor photo can hurt your brand. A wise idea if you haven’t done it already, is to have professional-quality photos taken of your product/location/people. These will come in handy for any current or future web and print design project you might want. We have the ability to use millions of colours on the web, but more isn’t always better. Picking two or three well-chosen colours that coincide with your branding will really help set you apart from other websites, and make a memorable impression on your readers. A simple layout and limited colour palette will clearly define your brand and help unify the tone of your content. Until recently websites were limited to displaying content in the fonts installed on each readers own computer. Since OS X, Linux, and Windows all come with different fonts pre-installed, there were only a handful of fonts in common between all computers that you could use with the confidence that it would show up the same universally. Lately, new technologies have allowed designers to use any font they wish on their website, whether the readers have it installed on their own computers or not. Starting today, we will see an explosion of the use of creative typography on the web, and a much more mature feel to web design in general. The web is different than print or radio, and the attitude is much more personal and playful. Try writing your web content like a conversation instead of a loan application. A little playfulness and whimsy goes a long way to making reader feel connected to you and your brand. The number one business trend according to a number of successful web entrepreneurs, is hand-written thank-you notes sent by mail. Don’t forget that the best advocate for your brand is you, and the time you take to connect with your readers. If mailing personal thank-you’s is out of reach for you, a heartfelt and grateful email can help build friendship and loyalty between you and your readers too. Best of luck to you this coming year from Engine Communications!